President Maithripala Sirisena and Prime Minister Ranil Wickremesinghe at the launch of Enterprise Sri Lanka. Pictures by Rukmal Gamage. Enterprise Sri Lanka, the government’s loan programme launched on June 22, is designed for young entrepreneurs in the country. The Gamperaliya scheme, implemented in accordance with Enterprise Sri Lanka in the country’s poorest regions, is one of the government’s primary focuses over the next two years. Enterprise Sri Lanka is meant to be accessible for all districts, rich and poor, most and least-developed. 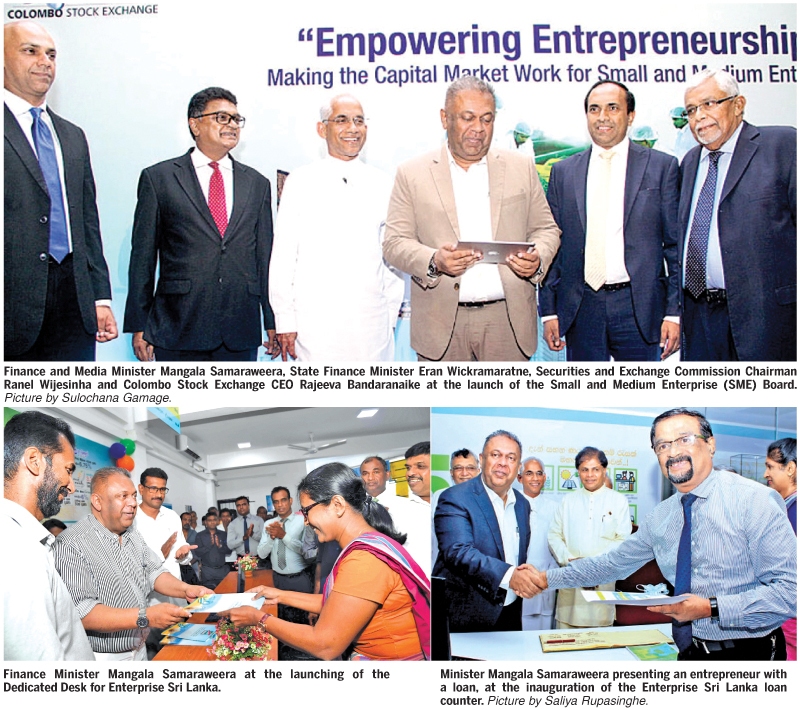 Finance and Mass Media Minister Mangala Samaraweera inaugurated the first exhibition on the Gamperaliya scheme last week, while an exhibition on Enterprise Sri Lanka had been planned to be held between August 29 and 31, in the Moneragala district. More would follow in the Anuradhapura and Jaffna districts as well. The exhibitions display the sweeping objectives of Enterprise Sri Lanka and Gamperaliya: raising the per capita income to USD 5,000, creating one million new jobs, doubling exports, and sustaining GDP growth at five percent. In its current iteration, more than a dozen loan schemes are expected to develop Small-Medium Enterprises (SMEs), promote green energy, empower farmers, reduce poverty, empower youth and women, as well as to promote tourism, exports and supply chain development. Through these programmes, the government seeks to address the development of the nation as a whole, but is it feasible? In many districts, issues of indebtedness and unemployment had crippled local economies. Would the programme be accessible to them? Government officials from the Northern and Eastern provinces said it would. Enterprise Sri Lanka offers collateral-free concessionary loan schemes for 16 different categories of entrepreneurs: farmers and fisherman, owners of houses less than 1,000 square feet, journalists, young graduates, middle-income youth wishing to purchase a house for the first time, to name a few. The government’s stated purpose is to diversify economic growth and create 100,000 entrepreneurs by 2020. Enterprise Sri Lanka would establish a new relationship between banks and Sri Lankans, to better serve the people. The scheme works in conjunction with all national banks: Bank of Ceylon, People’s Bank, as well as a number of private banks. Under Enterprise Sri Lanka, loans are provided through the banking system. Most of the schemes offer between 50 to 70 percent subsidies on interest rates. In some cases, under schemes designed for recent graduates and journalists, loans are given without interest. Sri Lanka had experienced economic growth during the last decade, characterised globally as a Middle-Income Economy, especially in the domestic sector. In 2015, the Census and Statistics Department, in conjunction with the World Bank, issued a report that the poverty rate was below 15 percent for a large part of the country. For the wealthiest districts in the country, the government’s Enterprise Sri Lanka loan programme is a way of expanding and stimulating further development of already-developed regions. In the poorest districts, the government is using the programme to develop under-developed areas. One of the most meaningful aspects of Enterprise Sri Lanka, is its debt relief packages which pay off debts of up to Rs.100,000. Whether or not the relief packages go far enough in relieving debt, remains to be seen. When discussions on Enterprise Sri Lanka began sometime in 2017, the Office of National Unity and Reconciliation (ONUR) had its own loan programme, which specifically addressed the needs of entrepreneurs in the Northern and Eastern Provinces. Since the government’s national programme came into being, however, the ONUR’s loan scheme was dissolved. If Enterprise Sri Lanka is to be successful in the North and East, it would have to provide what the ONUR loan scheme did and more. ONUR Deputy Directors Somasiri Ekanayake and Suduth Jayasinghe said that the ONUR’s mandate under Enterprise Sri Lanka, is to act as a coordinating body between the government and district officials. Gamperaliya, theoretically, would address basic requirements of young entrepreneurs attempting to run businesses, such as functioning roads and water tanks. In order for entrepreneurs to receive these loans, they need to have assurances from government officials that they are equipped to manage it. Under the ONUR loan scheme, those regulations were relaxed so all that was required of an applicant was submitting the support of two or three other bank account holders, such as other entrepreneurs from their village. It fostered a spirit of cooperative community development, at least in the process of receiving loans. But ONUR officials were unsure whether or not their recommendation had made it into the final draft of Enterprise Sri Lanka. “We highlighted this requirement during meetings. It is a barrier for the development of the Northern and Eastern provinces. We stressed the provision of concessional loans,” Ekanayake added. If the Finance Minister’s economic forecast is correct, stimulating domestic investment through loan schemes such as Enterprise Sri Lanka is important now more than ever. The government assesses that it would create jobs and propel innovation that would have a multiplicative effect on the expansion of the economy.